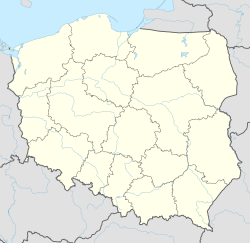 Dębki [ˈdɛmpki] is a village in the administrative district of Gmina Krokowa, within Puck County, Pomeranian Voivodeship, in northern Poland. It lies approximately 7 kilometres (4 mi) north-west of Krokowa, 25 km (16 mi) north-west of Puck, and 63 km (39 mi) north-west of the regional capital Gdańsk. The village has a population of 166. Wikimedia Commons has media related to Dębki. This Puck County location article is a stub. You can help Wikipedia by expanding it. This page was last edited on 27 January 2019, at 20:33 (UTC).